Having the ability to track an airplane flight is so comforting and reassuring. Both my wife and I discovered this amazing service and were very impressed with the speed, accuracy and just how user friendly this all is. Tracking airplane flights is no longer just possible to the specialists, these days practically anyone can do it. We're going to show you just how easy it is. But first, why would someone want to track any aircraft? Good question. Perhaps you have a loved one or a friend traveling overseas for a while. Could be that they are finally coming home after what seemed to be a very long time. Do you have to pick someone up from your local airport? Maybe you had arranged to have an important parcel sent to you and you just need to know all is well. Whatever the reason, some people just like to track a plane flight as they fly across the world. Here you can utilize any and all of the tools easily and of course totally free! To be able to track an airplane flight all you need is simple to use tools. Below you will find two very easy to use plane flight tracking tools. A suggestion would be to add this page to your Bookmarks so as to keep these tools handy. The very first one is called Flight Aware. Click here to make use of this flight tracking tool. See all of the red dots on the map to the left, yep they're actual airplane flights being tracked across America. Fascinating isn't it. Just to the left you will notice the heading "Flight Tracker". Below that find "Type part of airline name". The only details you will need to know and enter here are the airline and flight number of the airplane you are needing to keep track of. Now continuing on, just enter these details on the left hand side of this page and click on "Track Commercial Flight". Hey presto your airplane is now being tracked by you. Congratulations, see I told you it was easy to track a plane flight! If you are anything like me and just love to be able to see and do more I highly recommend this second airplane tracking tool (it's amazing). There is far more functionality meaning you are able to do a whole lot more after you have entered the details of the particular airplane you are keeping track of. Here's a hint for you - check out the image at the top of this page. 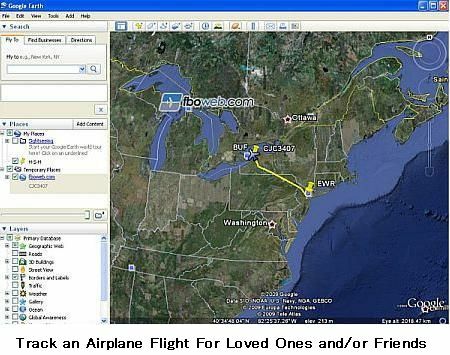 For more details and if you have never used this amazing airplane tracking tool before you're in for a great surprise. Before we can take advantage of this fantastic tool you are going to have to download Google Earth onto your desktop. Now let me introduce you to fboweb. As you did before click on this link to access it. These clever people have integrated Google Earth to track airplane flying across the globe at any one time. Just as you did before enter the information regarding the airline company and the flight number where you see "Track a Specific Flight". Right before your eyes you are taken on a flight of your own (very cheap way to fly wouldn't you say?) right to where your chosen flight is. There you go, you may now keep track of any flight for any purpose on any day you choose. Remember as I stated before to Bookmark this page so that they are readily available to you later. Do you need assistance to Track an Airplane Flight? Contact us by clicking here. Last flight to Airplane and Aircraft.com home page. Click here to learn how to leave your job sooner.